It is a wonder what a little summer cognitive rest can do for a person’s creativity. I cruised through June with very little motivation to do anything that required cognitive effort. Early July brought forth worries that I would never have another creative idea. Now, as I face mid-July, I feel like I am getting back into my groove. 🙂 The result = another FREE working memory activity for folks! We are surrounded this summer with Minion Mania – this new movie will be all our elementary friends will be talking about in September. 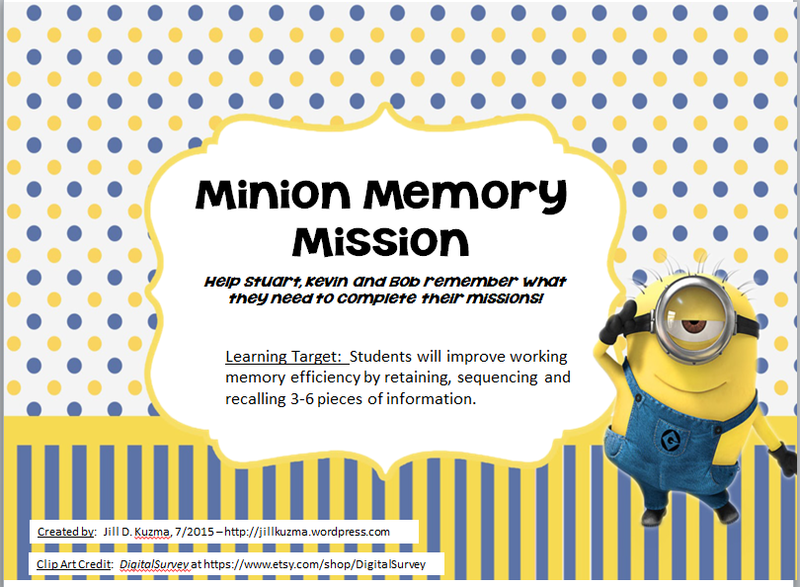 So, after a search to purchase some Minion clip art (Thank you to DigitalSurvey on Etsy), I created another Working Memory activity. It is called, Minion Memory Mission! 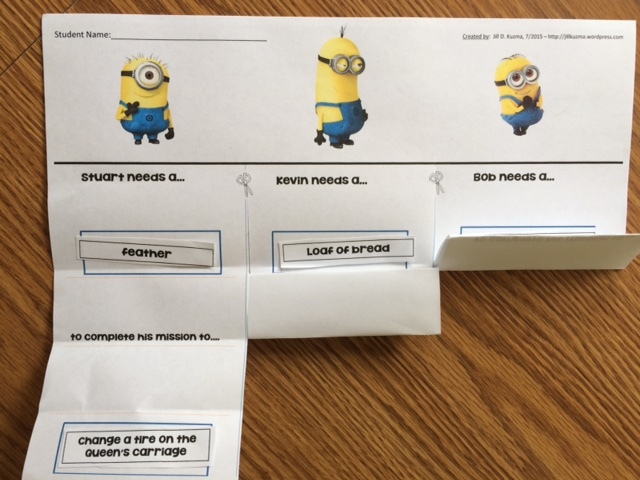 In this activity, students choose a mission and a “mission material” (object) for each of the three main characters, Stuart, Kevin and Bob. The missions and objects are all silly and mis-matched, so this might be a great opportunity to work on the expressive language skill of explaining absurdities. 🙂 Students create mission statements for each minion, sharing them among the group. 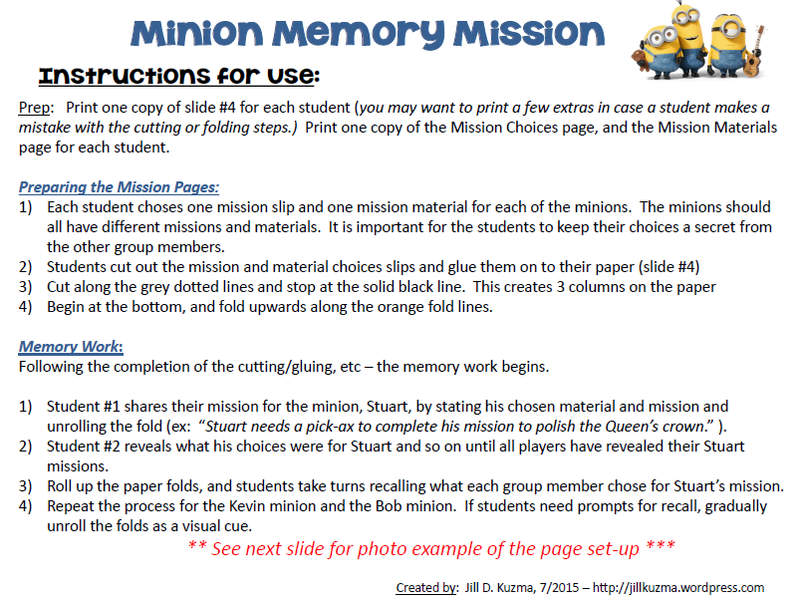 Group members need to focus and attend to remember all of the details, to later recall the Minion Missions. Here is a photo of the activity instructions…..